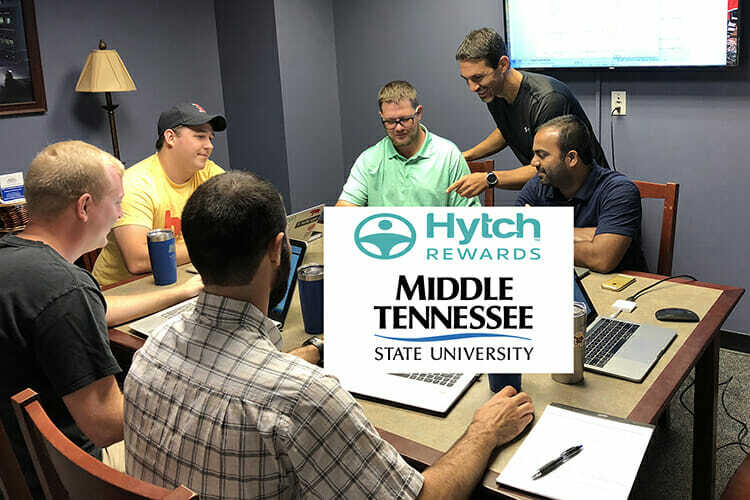 ‘Raidercade’ theme fuels MTSU ..
THEC votes down proposal to tr..
MTSU’s Data Science Institute is digging deep into data provided by Midstate social impact technology company Hytch to see how users of its app-based rewards program are affecting traffic throughout the region. The Nashville-based company has hired the MTSU institute to study data from the Hytch Rewards app and offer the company insights on how commuters are using the service, which seeks to reduce traffic congestion and pollution through ride sharing, carpooling or use of public transit. The goal is to identify Hytch’s impacts on traffic, such as reducing the number of single-occupancy vehicles. For example, the data may show that if Hytch takes 1,200 cars off the road through ride-sharing, it trims an average Midstate commute by 15 minutes, and according to the analysis by the student-led team at MTSU, for every car ride that is shared, at least one car is taken off the road. “The Hytch Rewards platform uses behavioral economics to influence transit decisions,” said Charlie Apigian, interim director of the institute and a professor of information systems and analytics in MTSU’s Jones College of Business. Hytch Rewards, available for iPhone and Android, helps users track shared rides, earning them “Trees Saved” whenever they carpool, ride-share or use public transit. People who live in sponsored areas or work for an employee sponsor can also earn cash rewards for each qualifying mile shared and tracked using the app. Hytch says its sponsors have injected more than $125,000 directly into the wallets of Nashville commuters who make smarter shared-mobility decisions. The rewards are funded by market and employee sponsors like H.G. Hill, Onin Staffing and Nissan. As an institute customer, Hytch officials anticipate patterns to emerge using data overlays with weather conditions, traffic flow and fuel cost data, for example. With a grant from the Tennessee Department of Transportation, Hytch says it is working with TDOT and more recently with the Greater Regional Nashville Council as well as WeGo Transit to design reward rules that reduce traffic throughout the region. Cleveland has been a popular guest lecturer in MTSU’s computer sciences, aerospace and entrepreneurship programs. Apigian started talking to Cleveland before the company’s app launched, resulting in Hytch contracting with the Institute through the MTSU Office of Research and Sponsored Programs. The Data Science Institute seeks to create opportunities for faculty and students to collaborate on interdisciplinary research; bring in substantial grants and funding for interdisciplinary data projects; and establish big data partnerships and projects with companies and other external entities. The Hytch project involves four students — one undergraduate, two master’s students and one doctoral candidate — as well as two alumni mentors. The team is also interdisciplinary, ranging from information systems to computational science majors, with students and mentors earning a small stipend for their work. “They’re doing really good work,” Apigian said. Apigian said he feels the institute’s academic setting allows the team he’s directing to review the data objectively and dissect it in ways that many private companies can’t. So the institute’s value isn’t necessarily solving problems for companies — they usually have personnel responsible for doing that — it’s telling them what the data means. MTSU recently notified the Tennessee Higher Education Commission of its plans to develop a bachelor’s degree in data science to build upon many of the attributes of the new institute. For more information about the MTSU Data Science Institute, contact Apigian at 615-898-2375 or email Charles.Apigian@mtsu.edu.